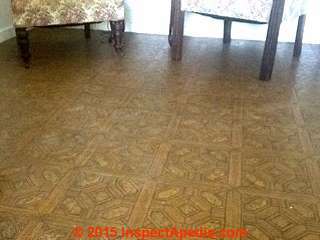 This article provides a guide to identifying traditional or early Congoleum rugs and other sheet flooring products, Congoleum-Nairn asphalt-asbestos, vinyl asbestos floor tiles, linoleum, and sheet flooring (resilient flooring). Some of these Congoleum floor covering materials contain asbestos in asbestos fiber or asbestos powder-filler form. Asbestos was found in at some Congoleum flooring products including: Congoleum-Nairn Flor-Ever Vinyl, Fashionflor Cushioned Vinyl flooring, Gold Seal Vinyl Inlaid flooring, Gold Seal Vinyl Nairon Standard flooring. SEQUIN PATTERN [image] Congoleum resilient flooring is shown above. I am doing renovation on a 1978 house. While busting up tile in about 150 sqft it was revealed that there was linoleum sheet flooring underneath. I could [not] read all the back of it but did see "Pacemaker" and saw it was a Congoleum product. I saw that product on a list of asbestos-related flooring, but the damage was done. Not all the flooring came up but a good amount did with the tile jack. Reply: 1970's Congoleum sheet flooring may contain asbestos - as well as Congoleum flooring up to 1984.
at CONGOLEUM FLOOR PRODUCTS CONTAINING ASBESTOS. However at least one reader reported having tested later Congoleum Pacemaker and finding it contained on asbestos. "Pacemaker II" from Congoleum contained no Asbestos in it. The trademark for the stamp was issued in 1982. Typical sources and the mesothelioma websites and lawyers typically assert that Congoleum's sheet flooring products between 1958 and 1968 contained asbestos. Other websites put the end date for asbestos in flooring as 1979. Still other law firms cite 1980 as Congoleum's last year producing asbestos-containing flooring. Asbestos has been confirmed in Congoleum sheet flooring by lab tests reported by some of our readers for Congoleum flooring installed as recently as the early 1980s. Note that that is a bit past 1980. 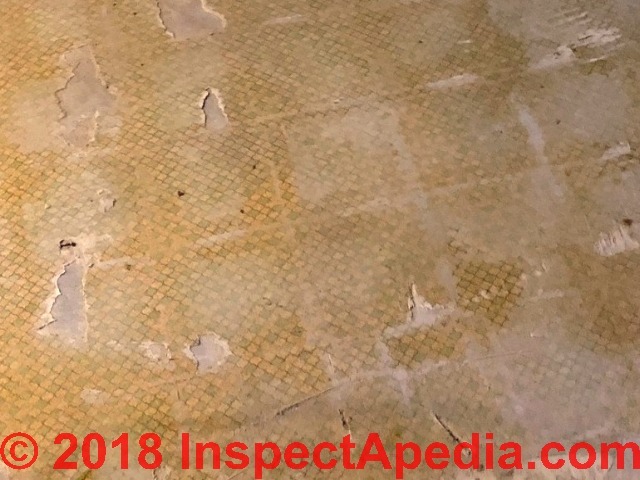 Now it's possible that "new old stock" asbestos-backed floor tiles or sheet flooring that were manufactured before 1969 (or those later years I cited) were installed at later dates but that assumption may not be sufficient to rule the asbestos-question in or out. It is common for both asphalt-impregnated felt-backed flooring products and the light or near-white waxy paper-like backing on sheet flooring from the 1970's and early 1980's to contain asbestos. See 1980 CONGOLEUM NO-WAX SHEET FLOORING - With Asbestos-Content - for an example. Therefore I agree that for a 1970's Congoleum floor material that has not been tested to confirm the presence or absence of asbestos, it would be prudent to treat the floor as PACM - Presumed Asbestos Containing Material. You will want to do the obvious: damp wipe, HEPA vacuum up dust, and don't make more of a dusty mess when removing the remainder. 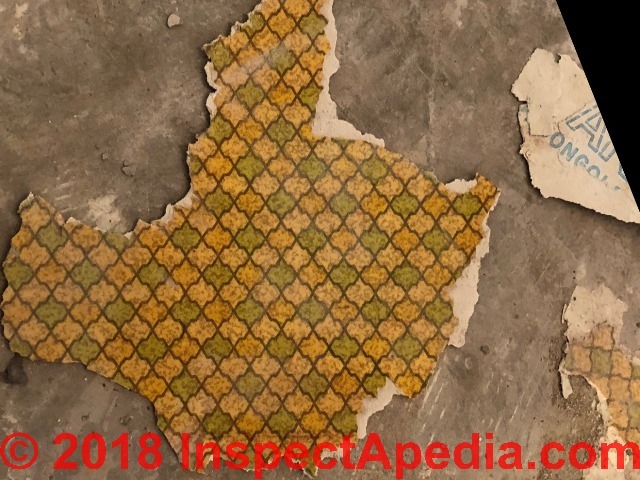 Below I will give two asbestos floor removal article links that you should review before doing more work on the floor in your home. see ASBESTOS TESTING LAB LIST and please let us know the result as that will assist other readers. If there are instances in which the Pacemaker stamp or other markings are clear I'd like to see photos of those as well as of the actual pattern on the floor surface and of course of the current state of the floor. That might let us comment further. Don't panic: doing so invites getting gouged by a cleanup company. ADVICE: For buildings with floor tiles that could be assumed to have been installed in North America before 1986 it would be prudent to treat the flooring as "PACM" or "Presumed Asbestos Containing Material". The presence of known asbestos-containing flooring does not mean we should panic nor that we should undertake an expensive and dangerous asbestos removal project. Generally the safest approach is to leave asbestos-containing sheet or tile flooring alone and to cover it with a coating or with another layer of flooring. I am doing renovation on a 1978 house. While busting up tile in about 150sqft it was revealed that there was linoleum sheet flooring underneath. I could read all the back of it but did see "Pacemaker" and saw it was a Congoleum product. 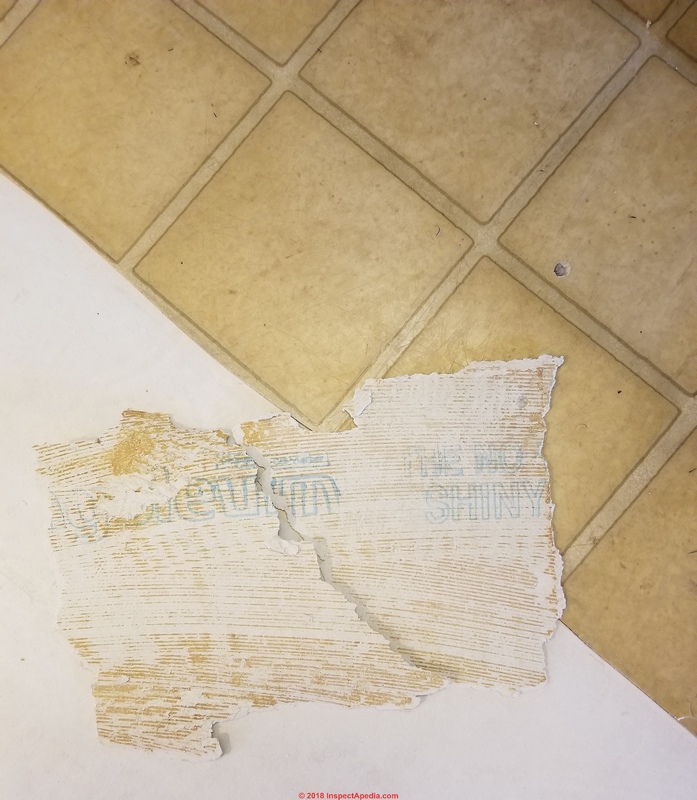 I saw that product on a list of asbestos-related flooring, but the damage was done. Not all the flooring came up but a good amount did with the tile jack. Don't do anything expensive before we know if this is an asbestos-containing flooring - or else have a sample tested. Hiring an asbestos cleanup company is still expensive. But so is making a dusty mess of asbestos debris that later needs still more-extensive cleanup. Congoleum Pacemaker identifying stamp on the back of the sheet flooring. 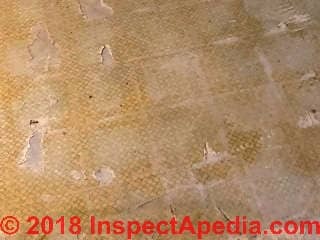 Watch out: often the white backer on older resilient flooring or sheet flooring like that shown above contains asbestos. Not even sure it'd be worth it at this point. I guess I need to get the flooring tested, too. I hate this. Or instead of testing, if it's all DIY, you could simply assume the floor contains asbestos and handle it accordingly. Congoleum Sheet Flooring Backer Text - Australia 1970's - Asbestos? This Congoleum sheet flooring and the photographs of text on the flooring backer were observed in an Australian home. The design pattern looks like some older sheet flooring whose backer contained asbestos. But we're not sure where nor just when this particular floor covering was produced. The pattern shown above does not appear in the current (2016) Congoleum sheet flooring catalogs scanned online at the company's website. 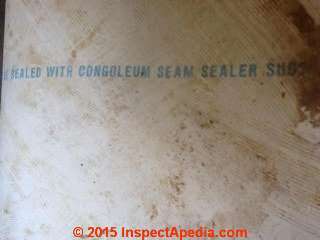 Above: text indicating that seams of this flooring product should be sealed with Congoleum SU106 seam sealer. 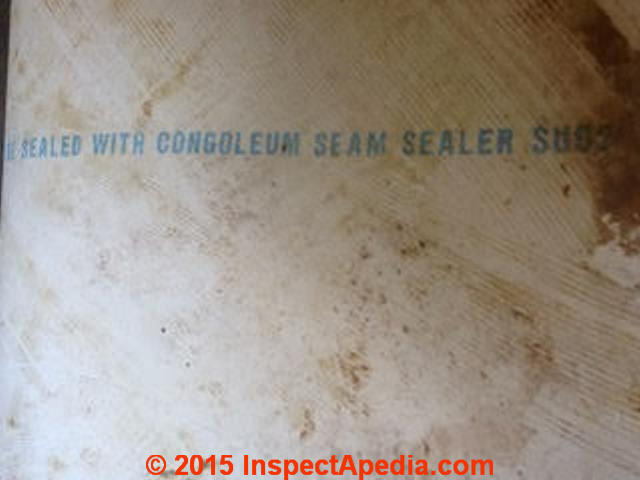 Congoleum's SU106 seam sealer is a current product (2016). This product is applied on top of the seam of Congoleum sheet flooring that has already been joined below using QuikStik adhesive tape. (You'll need to protect the sealed Congoleum floor seam from foot traffic for at least 16 hours.) This same seam sealing product can be used to repair small areas of damaged or torn flooring. 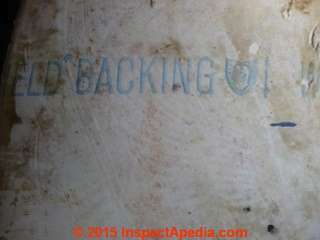 Below: close-up photo of text on the "back" of Congoleum sheet flooring. Modern, contemporary Airstep Congoleum sheet flooring seams are sealed with a Congoleum seam sealer kit and are used with Congoleum and IVC Flexitec vinyl floor coverings. The company provides an adhesive sealer for sheet flooring and a "QuikStik tape used for loose-laid flooring seams and to adhere the perimeter of sheet flooring to the subfloor. Sheet flooring can also be stapled down to wood floors or subflooring around its perimeter if those edges are to be covered by a wood floor trim. I appreciate your website and have spent an extensive amount of time researching a flooring that we're removing from our house. We got halfway through the floor removal before we realized we should worry about asbestos (yikes!). I've ordered an in-home test kit but in the meantime I wondered if you had any thoughts on the attached photos? Our home was built in 1979. The kitchen and dining room was covered in 12-foot wide vinyl sheet flooring made by congoleum. On the backer, which is white, the Congoleum name appears, along with what appears to say "The No Wax Shiny [vinyl?]" There's something written above congoleum but I cannot make it out. I appreciate any help or direction you can give us. With no other more precise date information you need to either treat the floor as presumed to contain asbestos or have a sample tested. If you can remove the floor without making a dusty mess you might eschew testing. Just an fyi...this flooring came back 20% chrysotile asbestos in the flooring itself, none in the mastic glue. Thank you Anon. Other readers will benefit from your report confirming asbestos in this 1979 Congoleum No-Wax Shiny Vinyl sheet flooring. In my experience often the white backer of sheet flooring from the 1970's contined Chrysotile asbestos. If the flooring adhesive can be dissolved - sometimes by mere water - enough that the flooring can be rolled-up and removed, you will have avoided creating potentially-hazardous asbestos-contaminated dust. Continue reading at CONGOLEUM-NAIRN FLOOR TILES & LINOLEUM - home, or select a topic from closely-related articles below, or see our complete INDEX to RELATED ARTICLES below. Or see FLOOR TILE HISTORY & INGREDIENTS. 1980 CONGOLEUM NO-WAX SHEET FLOORING - With Asbestos-Content. 1970's CONGOLEUM FLOORING at InspectApedia.com - online encyclopedia of building & environmental inspection, testing, diagnosis, repair, & problem prevention advice.